Unique Exterior Cleaning NW - Cleaning Services, Driveways/Patios/Paths, Fascia/Soffits/Guttering based in Urmston, Greater Manchester. Unique Exterior Cleaning NW have a reputation built on quality. We specialise in Driveway Cleaning and Gutter Cleaning services and have over 10 years' experience in the trade. We take great pride in our work and offer a good level of customer service. 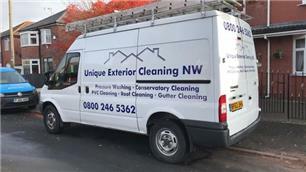 Some companies believe quality comes first, others believe value comes first, Unique Exterior Cleaning NW believe in both!